Located in the Andes foothills, Mendoza offers unparalleled opportunities for outdoor recreation, sightseeing and adventure outside the city. America’s tallest peak, located near the Chile/Argentina border on the international highway, attracts thousands of tourists each year. Inside the provincial park there are several options for avid hikers. Treks to the two base camps, Plaza Francia and Plaza de Mulas, are possible without a permit but require that you register at the park office in the city. The non-technical climb to the 6959-meter summit is actually surprisingly do-able for the average hiker, but it is strongly recommended that you go on a guided excursion with a credible agency. The permit is fairly expensive for a summit attempt, costing more than $700 US, but the reward is worth the expense, for if the weather co-operates, you will be standing on the tallest peak outside of the mighty Himalayan Mountains. A full day tour, originating from the capital, takes you to the major viewpoints along the international route to Chile. Although most of the day is spent in a mini-bus, you will be rewarded with views of amazing landscapes, so be sure to take lots of film. 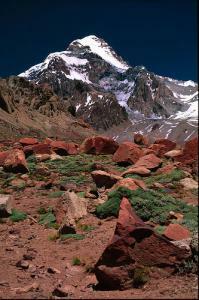 The tour stops at Potrerillos Lake, Aconcagua, Uspallata and, the highlight, Puente Del Inca. Puente Del Inca is a naturally formed bridge that crosses the Rio Vacas, one of the main tributaries of the Mendoza River. 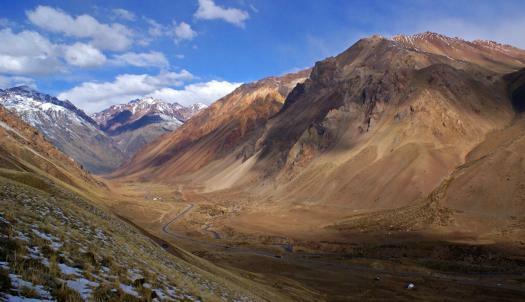 Situated among soaring peaks, the landscape is dotted with ruins, natural hot springs and unusually colored soils. Even the great Charles Darwin was impressed when he visited the area, having depicted the bridge in several drawings. 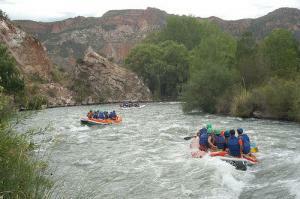 Mendoza offers a wealth of adventure tourism options, including Paragliding, whitewater rafting, skydiving, rappelling and mountain biking, among others. While most activities are done outside of the city center, trips can be arranged to pick you up early from your hotel and drop you and your exhausted body off in the evening. Remember, you are on vacation so nobody you know will hear your scream as you test your limits! This page rendered in 0.608 seconds.